Esterline Racal Acoustics (ERA): Wired for Sound? Wireless is More or is it? Wireless is More or is it? 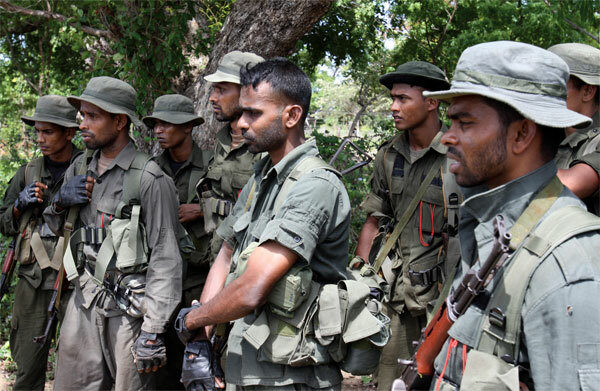 Sri Lanka is continuing its soldier modernisation plans continuing with the initiatives that it attributes to its success in defeating the LTTE insurgency. The key unit in recent operations has been the Special Infantry Operations Team (SIOT). The SIOT was developed as a concept by the infantry to fight and defeat the LTTE in sub conventional, guerrilla and counter insurgency warfare. The concept exploited the inherent nature of the infantryman, born and bred in villages and possessing the same attributes as a guerrilla. The SIOT saw the employment of specially trained infantry teams in four man, eight man and twelve man units as a means of surveillance, target acquisition and a human guidance system for delivery of effective combat power within LTTE controlled areas. The operational range and endurance of these small infantry groups covered a distance 5-6km over a period of four days. With replenishment, some of the teams extended operations to five days depending on circumstances. The Sri Lankan military attribute the effectiveness of SIOTs to seven main factors; operational endurance of the Soldier including hygiene, nutrition and medical factors; merging with the terrain with improved camouflage; reducing their signature by appearing as locals in terms of their tracks; extending the range of communications; improved power sources, more effective remote control devices and a better night operations capability. An improvement to rations was achieved simply by innovating using local food to extend operational range, duration and scope. Local solutions to nutrition were applied to ensure that lightweight energy and nutrients could be provided, utilising dried meat with honey as well as yams and tree roots. The expertise of locals in herbal medicine was also studied such as in the treatment of snake bites. This was noted as particularly useful for individuals during escape and evasion. To enhance operational endurance, caches of food were established, initially for experimental purposes. Due to the lack of proper sealing methods, some items deteriorated and some were sniffed out by animals until the problems were identified and rectified. Camouflage uniforms initially worn by Special Forces were olive green fatigues which were clearly visible in the jungle as a dark patch when wet and did not blend easily with most of the terrain. As a response, a new camouflage was used that better merged with most surroundings, focusing on a design that was complementary with the bark of trees. Many tactical problems occurred due to the signature of military boot prints. Experiments were conducted on how to reduce the signature of the boot. Finally a plain rubber sole similar to the slippers used by the locals were selected with significant results. Communication ranges was often insufficient, with an average range of 45 Km using HF. To overcome this deficiency intensive research was conducted Army with three communications sets employed in a relay method. An extended antenna, dubbed “Slim Jim” was used which extended ranges to 54 km. Individual hands free communication systems are now being sought as are improved HF communication systems with burst transmission capability for data and a more reliable satellite phone. Low cost commercial mobile telephones were often used to complement and at times supplement radio communications. It was noted that the LTTE extensively utilised commercial off the shelf satellite communications. The direction of indirect fires was a priority task given to the SIOTs with VHF communications being the primary communication system. Although direct communications connected the SIOT teams with battalion level mortar batteries, access to artillery support was only achieved by relaying target information through an artillery fire coordinator to the gun position. SIOT teams are being provided with two VHF radio sets and one Sat phone to support this and other tasks and more secure links are also being sought. Remote control devices were experimented with for years, using commercially available devices produced locally. After modification by the Sri Lanka Army these were regularly used to enhance the effectiveness of ambushes. Most night operations were confined to ambushes due to insufficient equipment and at times equipment had to be pooled between units. An upgrade plan is currently being contemplated with the aim of improving the ability to conduct movement at night and add a limited night fighting capability, integrated on personal weapons, an area which will also be enhanced with the addition of new day sights to enable precision engagement in an urban environment. Since night vision equipment was used on a scale of one per team, this required team members to follow virtually blind. On most occasions, movement through the jungle was conducted during the day due to this lack of individual night vision devices. The jungle terrain also reduced the efficiency of image intensifiers and use of infra-red devices was detectable, due to the close nature of the terrain and the activeness of the system. Other improvements will include the introduction of a Light Weight Under Barrel Grenade Launcher fitted to personal weapons on the basis of two per eight man team. The teams currently use 40mm Grenade Launchers as an additional weapon, which enhanced the firepower of the team but was found to be cumbersome. In terms of navigation, existing weapons are to be upgraded with digital compass fitted on each personal weapon and integrated on day/night sights. Integration of the compass and GPS on individual weapons systems will enable effective navigation whilst preserving the ability to respond effectively to sudden contacts without impeding the carriage and use of personal weapons. Cheap civilian utility range finders with ranges up to 300 m were used effectively by the LTTE. The Sri Lankan military is considering considering their use on laser designators on the basis of one range finder per team. Commercial mini-solar equipment to recharge the batteries of the communication sets as well as GPS and SAT phones was also introduced. In operations however this had limited endurance and a more rugged optimised solutions had to be provided. For Power, interoperable batteries and a common recharging system for equipment are being sought. During recent operations, power was preserved to support operations over a period of three to four days with the use of strict radio discipline, communicating only when required. Sri Lanka is seeking lightweight, interoperable batteries for communications systems, night vision and range finders will also be used to support the support the goals of the reduction of soldier load and overall sustainability. Colonel HP Ranasinghe was speaking at IQPC’s Soldier Modernisation Asia 2011.